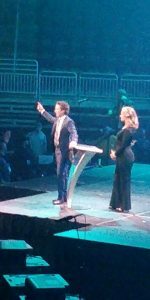 Night of Hope with Joel Osteen and his family at the Giant Center in Hershey PA. The testimonies were miraculous, the music uplifting, and the messages were so far beyond what I had expected. God really spoke to our hearts and so many people stood up at the end to either give their lives to the Lord or rededicate their lives to the Lord. Incredible, inspiring, faith building. Hope has breathed into my life and refreshed my spirit. Seeing Joel and his family in person was really something. They look the same in person as they do on TV. It’s been quite a long time since I saw his son on TV and to see how he has grown was amazing. Joel’s mother gave her testimony of how God healed her of cancer. Victoria spoke a few times and was so anointed in all she said. Their son sang and was amazing also. 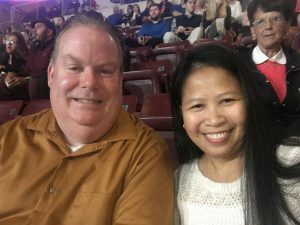 Their daughter wasn’t a part of it as she’s in college. Here are the notes I took of the different talks and the sermon Joel gave. Victoria talked about how much their travel and how the one thing she doesn’t like about travel is having to pack the bags. She wonders if she packed everything they needed. That maybe she forgot something or left something out that they would need. God packs our baggage. God packed it, and He didn’t leave anything out. It’s up to you to unpack what God has given you. Set the tone of the day in the morning. Faith will work in the positive and the negative. Start by being grateful. Thank God for what you do have. -Happiness doesn’t fall on any of us. It’s a choice we make. Let every morning be a new beginning. God will give you beauty for your ashes, but you have to let go of the ashes to receive the beauty. God is not mad at you. He is madly in love with you. When you believe, everything is possible. It doesn’t say when you figure everything out. See yourself the way you want to be. Bring Gods word to His attention. God is getting you ready for what He has for you. God is getting you prepared right now for new things He has in store. You have to see the seeds of greatness in others. Tell them what they can become. All the circumstances say it is not going to happen. It would have happened by now. Gods promise does not have an expiration date. Too often we disqualify ourselves. God does not cancel our destiny because of our mistakes. God has mercy for every mistake. What He has promised you is still on the way. God is saying an increase is coming. Quit believing that it’s too late. Your mistakes haven’t changed Gods mind. Say “Father, Thank you for what You have promised is on the way. Abraham and Sarah having a baby. God never disqualifies you, now stop disqualifying yourself. You are blessed at the end of your rope. When you are at the ned, it’s a blessing in disguise. God is going to make up for what you don’t have. Don’t let your circumstances fool you. Don’t let the time that has gone by fool you. When God is involved, what is impossible becomes possible. STay in Gods timing. God is working on you in the silent years. God has not forgotten you. Stir up your faith. The Lord God Almighty is working on your behalf. 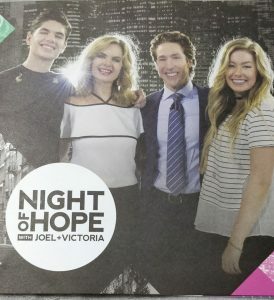 This entry was posted in God and tagged Joel Osteen, Keys to living a life of victory, Night of Hope, The Promise is coming. Bookmark the permalink.